AIR 1. 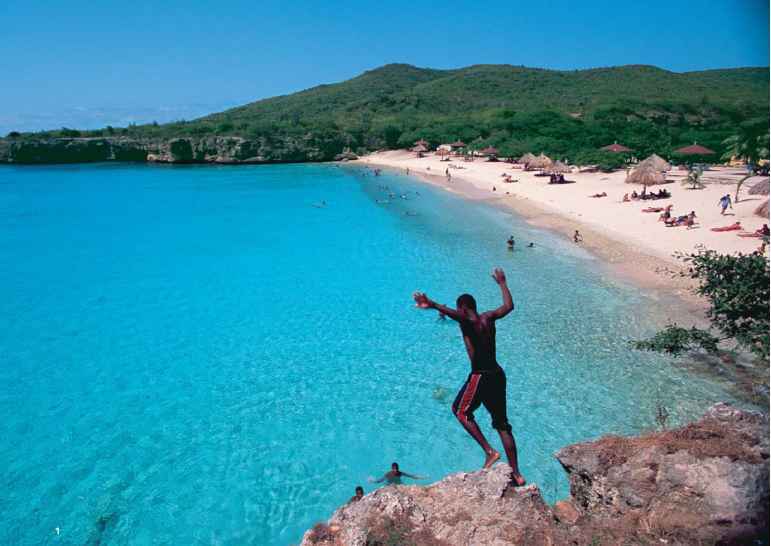 Doing the high-dive at a local favorite, Knip Beach. 2. Fairy-tale Dutch architecture along the Willemstad waterfront. 3. The famous Tugboat. 4. 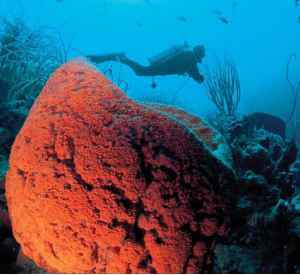 Elephant-ear sponge on the Director's Bay dive site. From the brightly colored Dutch-style buildings on the Willemstad waterfront to vendors conversing in Papiamentu at the floating fruit-and-vegetable market to parrots perched in cacti next to a brilliant blue sea, Curaçao hints of the exotic at every turn. Yet its location, just off Venezuela in the Gulf of Mexico, makes this island a conveniently brief trip for most North American travelers. 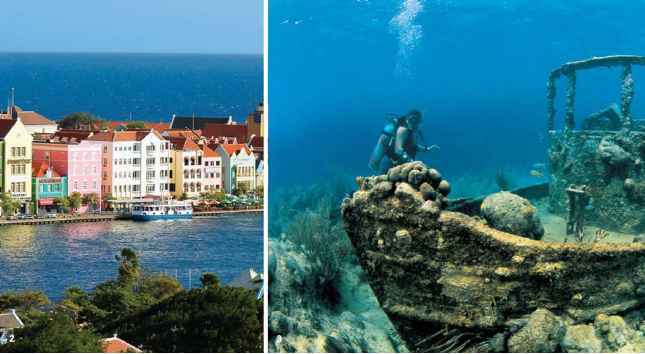 Visitors often remark that Curaçao, with its working-island atmosphere, has a distinctive personality often compared to other places in the world but not to be reproduced anywhere. Its diving certainly falls into that category. If you're diving on a tugboat with camouflage-festooned scorpionfish sleeping next to it in the sand, then you must be in Curaçao. AVERAGE WATER TEMP: 78-83°F WHAT TO WEAR: Diveskin in summer, 3-5mm in winter. AVERAGE VIZ: 80100 feet WHEN TO GO: Year-round; coral spawns during September/October full moons. 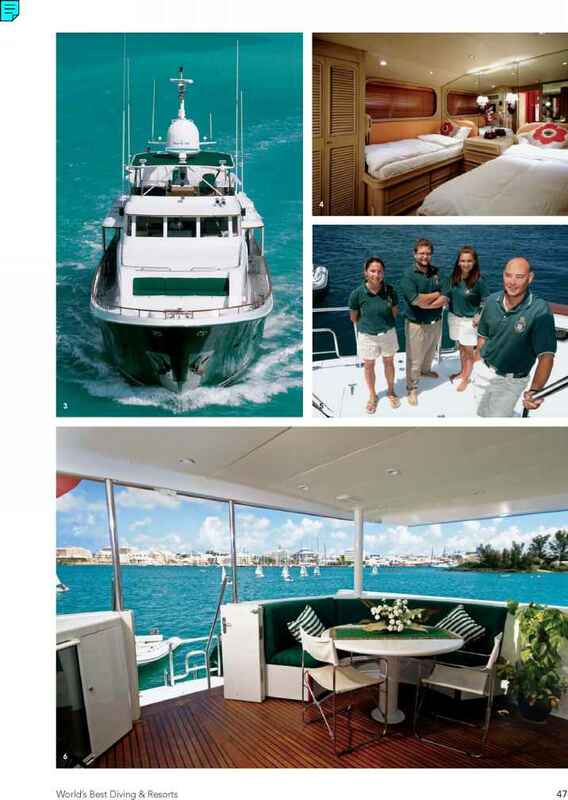 WHAT TO EXPECT: Calm and current-free dives, coral fields that seem to go on forever, and a possibility of porpoises. LANGUAGE: Dutch and Papiamentu, although most locals speak excellent English. TAXES: Room tax 7%; service charge, 12%. ELECTRICITY: 110130 V; most U.S. appliances work here. TIME ZONE: Atlantic Standard Time (Eastern Standard Time plus one hour). And if you are hovering over a coral reef that looks like giant mushrooms as far as the eye can see — on a dive site called "Mushroom Forest"— then you can't be anyplace else. The character of the place even comes out in its signature shipwreck, the Superior Producer, which, while intact, is not an artificial-reef project but an honest-to-goodness wreck, a ship that actually capsized just outside the Wil-lemstad Harbor entrance just before Christmas in 1977, creating a holiday-season salvage effort that people still talk about today. 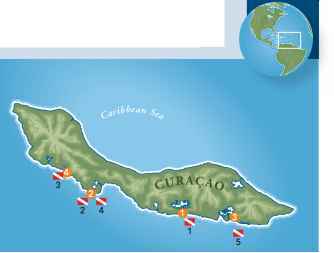 Lots of character, stellar diving, and an atmosphere that's familiarly exotic — it's easy to see why, for many divers, Curasao is the number-one "close" location on their international list of favorite destinations.